There always comes a time when you really wish you had a spray to cover up bathroom smells whether it’s for yourself or someone else. NO ONE likes to poo at other people’s houses when they’re visiting. It’s just plain embarrassing. Whether you’re throwing a party or going to one, you can now be prepared! This Poo-be-Gone spray works just as well as its touted predecessor “Poo-Pourri ” and costs a fraction of the price. No longer will anyone have to suffer the stench of the less than pleasant “peel the paint off the walls” poo smells that may emanate from the bathroom. No more holding your breath as you quickly try to pee because someone “paid their taxes”. No more holding it in at parties and get-togethers because you’re embarrassed to do your doody. We’re all saved! Hallelujah! 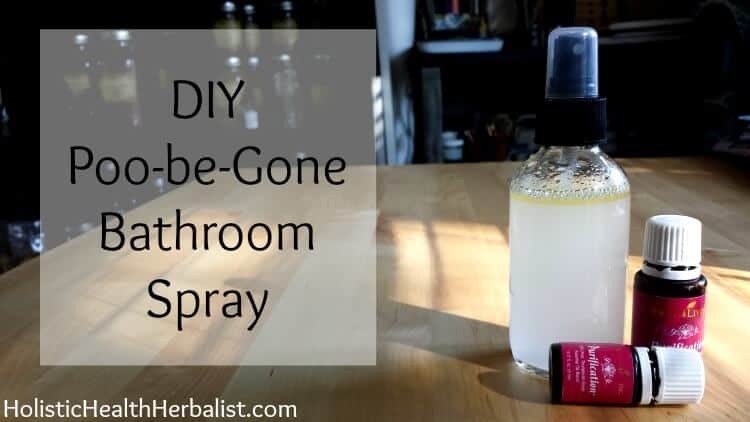 How Does Homemade Poo-be-Gone Bathroom Spray Work? Essential oils my friends. They literally create a pleasantly smelling physical barrier on the water’s surface trapping the unpleasant smells beneath. My favorite essential oil to use has been Purification; a blend containing Citronella, Lemongrass, Rosemary, Melaleuca, Lavender, and Myrtle. Honestly, this is the best blend I have come across for even the worst smells. It literally kills odors in their tracks. No more stinky trashcans, shoes, garbage disposals, wet dog smell, OR stinky poo. It’s the perfect poo pourri dupe recipe! 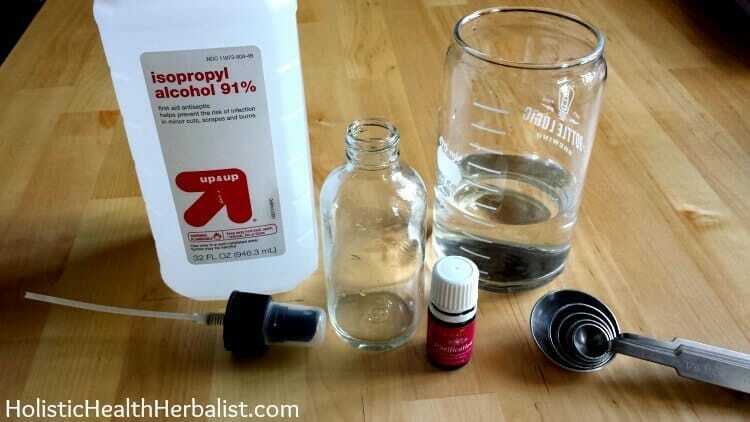 • An empty spray bottle (I used a 4 oz size)You can also use a plastic one if you prefer. 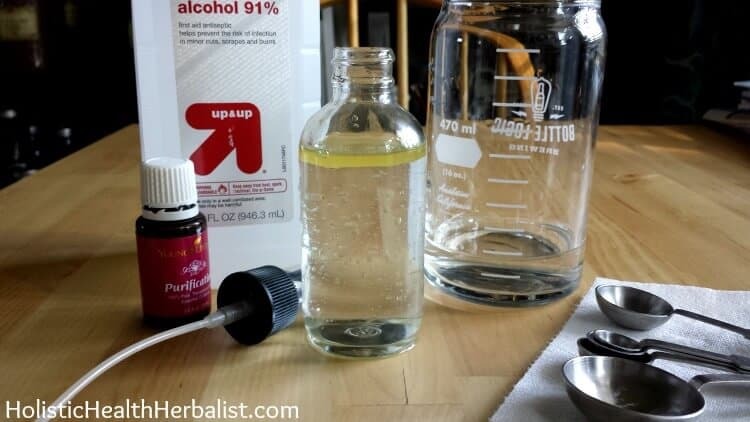 ***You can half the recipe below for a 2 oz or divide the mounts by 4 for a 1 oz size bottle. I used the biggest spray bottle I had on hand so the amounts below are for a 4 oz size. • Spray the toilet water in the bowl with about 5 or 6 sprays. Of course, use more if you feel the need. Hey! Did you notice that? No icky smells! What Other Essential Oil Blends Can I Use? There is a lot of wiggle room for a spray like this as far as choosing essential oils. I personally find that as long as you use enough essential oil in the recipe, you can use any scent you like. Don’t forget to check out my new version of this recipe HERE. It has more solubility and creates a better “film” in the toilet bowl for extra odor fighting goodness. Have you ever used the fabled Poo-Pourri? How did you like it? This is OK, and smells nice, but is not very close to the poo pourri formula, which is opaque. With original PP, the essential oils don’t float on the top like that, and when you shake it up it’s milky, and really does form a film barrier on the water. Has anyone found a way to replicate that? Still searching. You can try adding a dispersant like ted turkey oil to keep the essential oils mixed. It will give the spray that milky look and film barrier. Perhaps I will make an updated article on the topic soon! 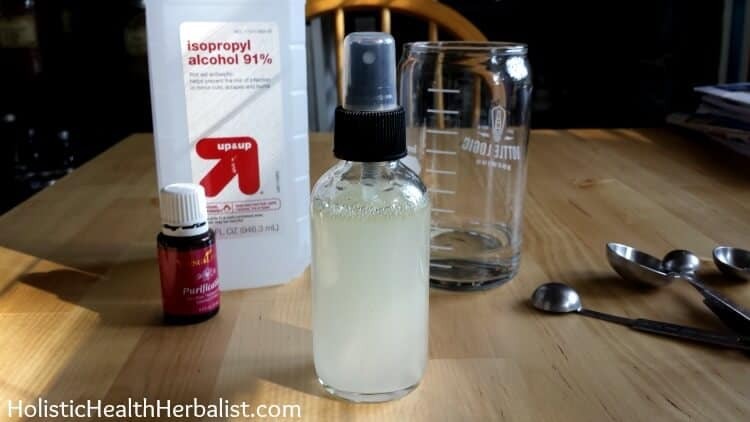 I add a few tablespoons of braggs liquid all purpose soap to my 16 oz bottle and it creates the top film/barrier to keep the smell under the water, or I use vegetable glycerin. by Tash” article to use “Purification” essential oil but the link u have included doesn’t take me to somewhere I can purchase it nor does a search for “Purification” on the website. That just takes you back to the article. You can certainly use this as a spray in the air! Is there any thought as to whether baking extracts would work as well? I noticed today that, almond extract, for example, is just oil, alcohol, and water. Just about the same ingredients as these cool DIY Poo Scent chasers . . . Any thoughts? Oh! I’ve never thought of this before! Sounds really interesting 🙂 I bet you could use any baking extract you like for this and get similar results. Let me know how it goes! I am considering selling them. Has anyone an idea of how long is its durability (Last long … day … month?)? When to start Essential oils lose their scent? Essential oils can last for years if stored in a cool dark place with the caps tightly closed. I have had some oils for almost 10 years and they still smell amazing. The trick is how you store them 🙂 If you are interested in selling oils, please let me know. I can help you out. Hi..I love your site and we were just talking today about making our own poo spray. I guessed lemongrass. Thanks for recipe. Won I never dreamed it would be a whole 5 ml bottle of oil though! This may sound crazy, but could you substitute the essential oils for a more “unscented” (aka “discreet”) version by using something like olive oil? If the oil/alcohol mixture works by making a barrier on the surface of the water, it seems like it could work with other types of oils. While I would much rather fill a public restroom with the scent of essential oils than poo, I would still be interested in a more unscented option. What do you think? This sounds really interesting! It just might work if you use enough oil. The only thing I wonder about it the olive oil staying in the toilet if used at home. Essential oils are naturally very good at killing bacteria, but olive oil is not. Ah, good point. Don’t want to make the toilet all greasy! I may make a small batch and try it out though! Not a gross question at all. In my personal experience, the Poo-Pourri has a pretty strong smell itself, so once you spray the recommend amount of sprays on the surface of the water, its pleasant aroma tends to mask most of the gas smell. I also “flush on impact” and that helps as well. And then sometimes I’ll spray the surface of the now clean water again, just for good measure. I can’t wait to make my own. Thanks for the recipe! Nice job, Tash! I’ve been looking for this and yours is almost perfect. May I make a suggestion? The reason that we don’t drink rubbing alcohol is because the poisons that they put in it might go through our stomachs, our intestines, into our bloodstream and end up damaging our organs. If we breath it in (as we spray it), we bypass the stomach and intestines and go straight into the blood via the lungs. In the few cases where I use alcohol like this, I usually use the cheapest vodka that I can find. Yeah, it’s a 700% increase in cost, but it’s just a small portion of your ingredients list and I don’t have to worry as much about my granddaughter getting a-hold of it and drinking it, either. If you’d like to try this out, I’d suggest doubling the amount of vodka, as it’s part water already. Sorry for the long post and thank you again. This helped alot! Does it have to be distilled water? You can use any water you like. I just use the distilled because the tap water in LA leaves an icky residue in my glass bottles. I have a friend who swears by Poo-Pourri. I know it stops the stuff in the toilet from smelling but….this is going to sound gross…wouldn’t the gas coming out while you poop be just as smelly? And it won’t stop that. Does that become an issue or does it cover all the smells pretty well? Well, I suppose if lots of gas is an issue this maaaaaay not work AS well. It would serve as a good air freshener if needed. Everyone is different even from day to day. For extra strength, you could always add more EOs to the mix. This may sound gross, but I always “flush upon impact”. All the stuff goes down, including the gases. A spray of this on top, along with my other suggestion, and you will be good to go!